Excuse my unnecessary excitement. I am still feeling very high from last weekend’s relay race. This race, to me, was no ordinary race. It was nothing like the other races that I’ve participated in. The race itself and how this team came about is something I hold close to my heart. We would have to go all the way back to February 2014 – where it all began with an invitation. 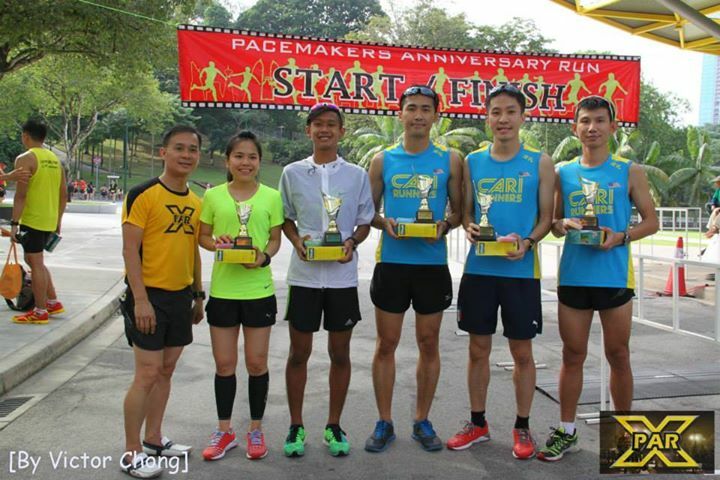 The team captain, Shu Wei, asked if I was interested in taking part in a relay race. At that time, I didn’t even know relay races (on the road) existed (shh, don’t judge). I was pretty surprised when he asked because he (and the rest of the guys) only knew me through the Puma Running Club and it was only over a few weeks. The thing about relay races is that you are not alone. This is no longer your race. You are running for your team. Your performance affects everyone on the team. One member can either make it or break it. And I definitely didn’t want to be the one to break it. But for some bizarre reason, I agreed, even though I had doubts about myself and my abilities. Given enough thought, I probably would have declined. I guess this is one of those rash “20 seconds of insane courage” decisions. And it was one of the best decisions ever. I am grateful that they had the slightest hope in me, believing that I could do it. 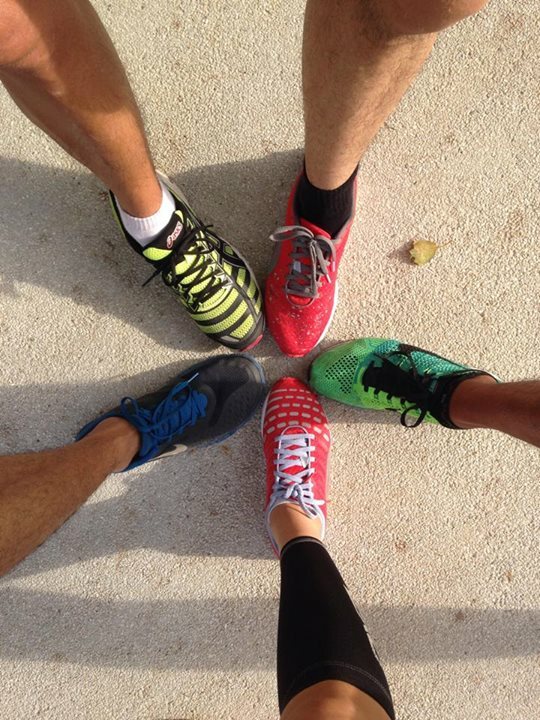 This was the stepping stone as to how I came to know this huge running community that I never knew existed and which I can now call family – the Cari Runners, the Puma Running Club…… Becoming a part of a community was a huge step for me. It was out of my comfort zone. Training and running around with a bunch of people that I had just came to know is not something that I would normally do. Thankfully, they welcomed me with open arms. The immense support, encouragement and motivation from this group made running that much more fun. The months leading up to race day were filled (okay, I’m exaggerating. It was countable. Haaaaaa!) with training sessions. Slowly, I got to know my teammates. Most of which I have been communicating with via social media and haven’t actually met them in person. Yeah, I agreed to run a relay without knowing who my teammates were. Crazy stuff. In April, one of our teammates, Fabio, met with an unfortunate accident in the Ironman event. Thank God that he was alright. The problem was that he had to pull out from the team because he needed time to recover and could not start running/training just yet. And just like that, we lost a teammate. Despite Fabio’s condition, he was still a team player. He supported all our training sessions by being there either as the time keeper or the photographer or both. Around the same time, Bryan showed up. We knew him as that-super-fast-kid through the Puma Running Club. We didn’t hesitate to ask if he was interested to join us. He agreed without (if any) hassle. So, we were back on track (although we weren’t exactly desperately looking for a replacement). 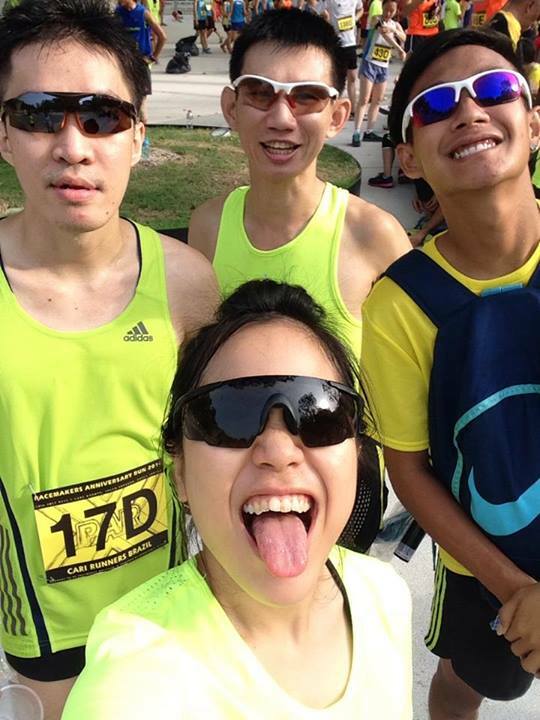 We only managed to train once as a team because Hoo Yeen Ho was from Melacca. He came over one weekend to join us (this is dedication people!). We practiced the race route 2 weeks before race day. The route had a mixture of flat road, uphill and stairs (total distance of 3.14KM). This was not only a test of speed but also a test of strategy and pace. 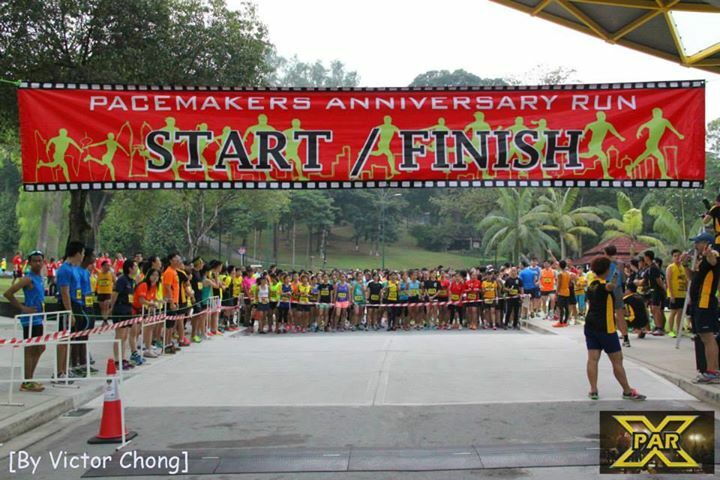 Go too fast at the start and you risk exhausting all of your energy stores before reaching the hill and the stairs. It was finally time to put our training to the test. Although I only had 5 hours of sleep the night before, I was feeling pretty good. We (HYH, Zi Shen, Kevin and myself) arrived at about 6.30am. I was still pretty cool and calm. Slowly, as the crowd began to fill the area, my nerves were through the roof! We gathered the team, took a few photos, met a few people, did a quick warm up and I was off to the starting line. At 7.30am, we were off. I had a mini “UH-OH, THIS IS IT, WHAT DID I GET MYSELF INTO” moment. The pressure came from needing to pull a big time gap from the other runners. Every second counts. 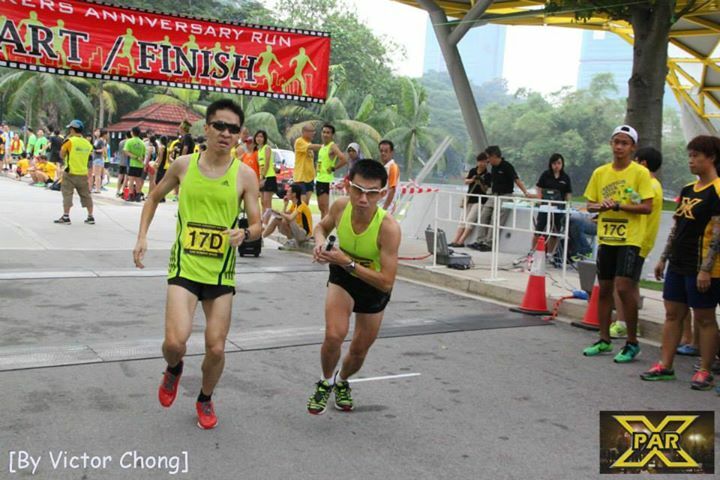 I had to give everything I had in 3.14KM. Some support from my teammate. Zi Shen has been the main motivator in this team. Always stirring up the race mood by monitoring our performance and keeping the team together. JJ was ready and I couldn’t wait to hand the baton over. Done! I came in 3rd, behind Amelia and Chooi Fern. I was so happy when JJ came back (screaming and jumping up and down), because he still held us in 3rd place! And of course, Bryan. Although he managed to continue to keep us in 3rd place, the pressure was still on. Cari B team leader, Zi Shen, also came in 3rd. By then, we knew we had secured our placing. It was so intense. I was on the “edge of my seat” the whole time. 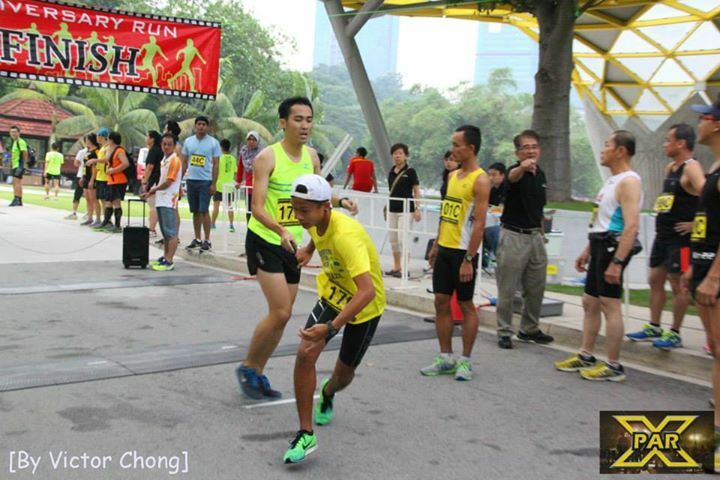 Running up and down, waiting for my teammates to reach the stairs and cheering them on at the finish line. Our 5th leg runner checked in and we were DONE! Felt like a huge weight had been lifted off my shoulders. 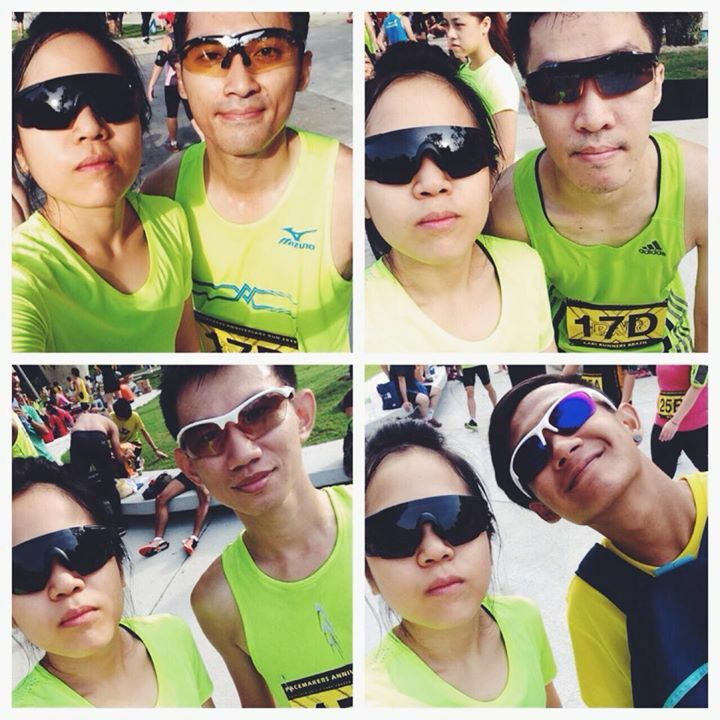 We had loads of time to kill while waiting for everyone to complete the race. THEY SERVED WATERMELON! OH YUM! And Nasi Lemak, assorted buns, soya bean, isotonic drinks and tao foo fah. But I was only interested in the watermelon. We agreed to bring our shades (to take “cool” pictures of ourselves). Just for the fun of it. Oh, the silly things you do with your teammates. 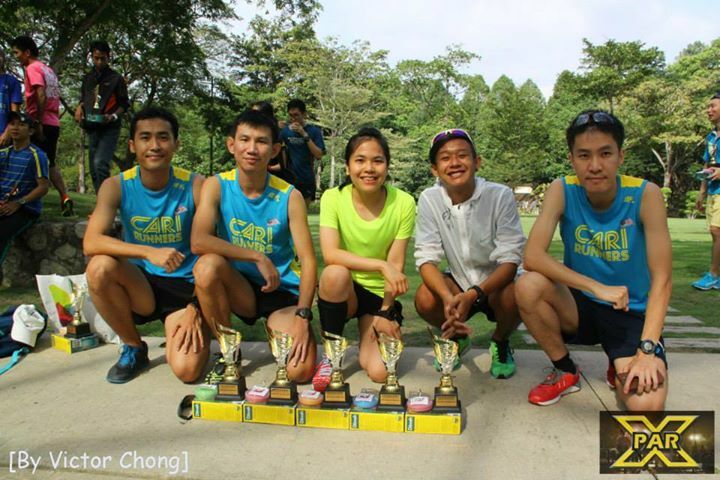 Team Captain (Overall Cari A and B), Goh Shu Wei. 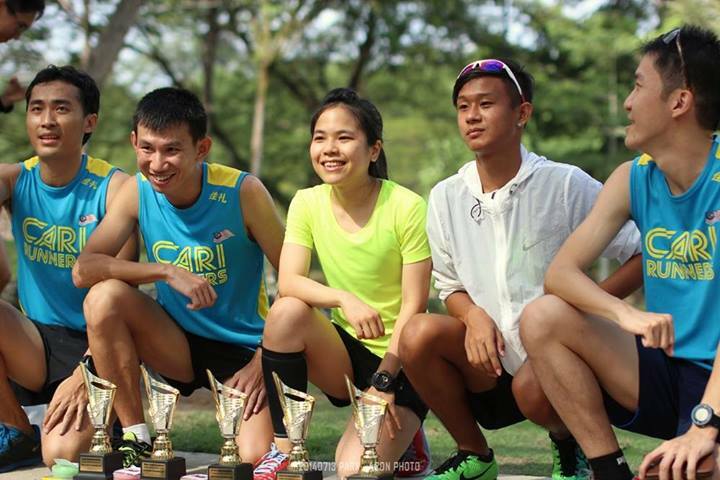 Cari A’s female runner, Chooi Fern. WHOOP! Successful jump shot (after many attempts). My ultimate supporter. 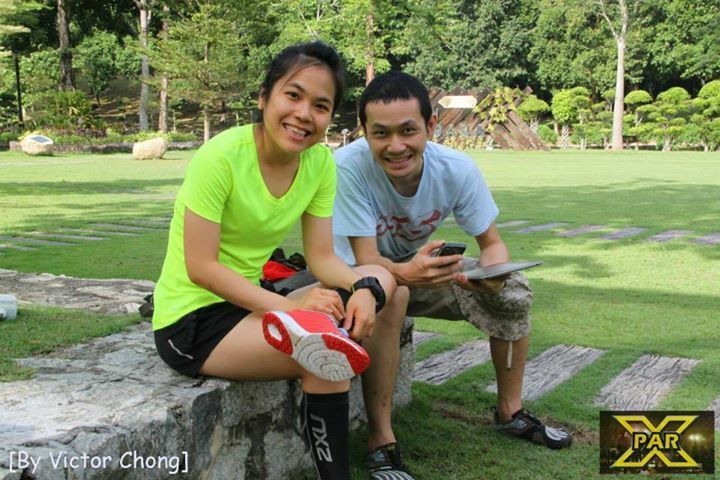 Thanks for accommodating my hectic running schedule and just being there for me. From seeing me at my worst to being there at my highest, I truly am blessed to have you. After about 2 hours, it was finally time for the prize giving ceremony. Top 3. Not too shabby. Cari A and Cari B. Top 2 and 3! POWAHHHHH! We took SO many pictures, this was us laughing at ourselves. Sum-up collage courtesy of JJ. I am so happy with this team and what we have achieved together. Honestly, I was only aiming to be in the top 10. We may not know each other that well but that kind of team spirit (so strong, so solid) was there. Everyone gave their 100% and we pushed ourselves beyond our limits, for each other. All 5 of us managed to hold the team in 3rd place throughout the race. And that is the beauty of any team sport. Fighting all the way, not only for yourself but also for your teammates. I love you guys! Thanks for this memorable experience. Growth begins when you step out of your comfort zone. That’s all for the day folks!